“The reason so much (of the Arctic ice) went suddenly is that it is hitting a tipping point that we have been warning about for the past few years." and Mark Serreze placed the blame squarely on CO2. Then what happened? We had multi-year growth in Arctic sea ice. But maybe the BBC are ahead of the curve as just a few days ago they were saying polar bears face a tipping point due to climate change. When the raw data disagrees with what VIs are coming out with, you have to wonder what their ulterior motive is. Destruction of western industry to "prove" capitalism doesn't work? Sounds about right. I am not sure what you are trying to say.... scientists get things wrong like the rest of us. Some people will say anything to make their voice heard. The trick is knowing enough to spot the nuts. For many researchers the issue is funding - they get funding from those with an interest in the outcome and set out to prove a hypothesis, rather than draw conclusions based on evidence. Cart before horse. One of the more recent in the long list of doomsayers predictions that have proven to be wildly innacurate. I remember sitting in a lecture at the Polytechnic of Central London in 1975 and being told the oil, and much else, would all be gone by 2000. What with falling crop yields and increased energy demand due to global cooling the future looked like a bit of a b'stard. There was less ice in the 1940s and 1950s, for instance - it seems to vary on all timescales. Good call! Global warming and climate change are a myth and a con. You heard it here first! What do you call a Polar bear on holiday at the South Pole? I remember sitting in a lecture at the Polytechnic of Central London in 1975 and being told the oil, and much else, would all be gone by 2000. And then they found North Sea oil and gas they said that Britain would be self-sufficient in oil and gas for a long, long time. Now North Sea gas is running out and oil output has peaked. In fact your lecturer was out of date at the time because the North Sea bonanza was already under way in 1975. The most glaringly bad prediction by an expert , made in about 1970, is that Britain's population would double by 2000. I've got a book about it, it's down in black and white. Instead it's gone from about 55 million to 60 million. It's funny, but since the general election and the banishment of Labour, climate change has gone very quiet. Maybe, if the evidence for climate change (which was admittedly strong during the 1990's), continues to be diluted year by year as new statistics are added, supporters will just quietly drop the subject. No satellite data, but miitaries kept records. 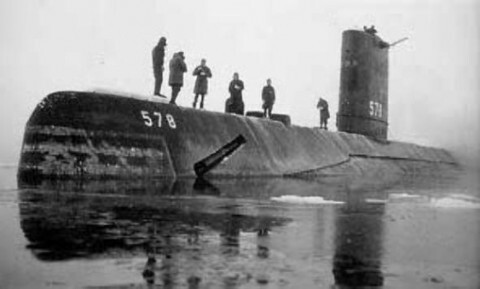 For instance there is a picture of USS Skate surfacing at the North Pole in a March in the 1950s (the month of Arctic ice maximum!). They've never been able to do that in recent times. Or they'll morph to seeking the same solutions for a different problem. It's no coincidence that "climate change" became a problem following the demise of socialism, the same ragtag of capitalism-haters just morphed into a new cause. I expect "peak oil" will be the next calling card (the same groups now seem to believe in both), and the BP disaster in the gulk will no doubt be used for some political ends eventually. "Climate change" is just a solution gone in search of a problem. The main reason we don't hear so much about climate change these days is because "climategate" turned out to be a damp squib. These was no fraud or cover-up, much to the dismay of the sceptics and deniers. In fact, according to GISS data, this year has been the warmest ever recorded so far. And the Arctic ice is currently at its lowest recorded extent for this time of year, except for 2006, as you can see from PID's graph. Weren't the "it's all the sun" brigade forecasting a cooling period? Some years the ice is thin , some thick , same as it's always been. Just wait for La Nina next year. Climategate wasn't a damp squib it showed the widespread manipulation of data, trashing of the peer review process, and incompetence of the code used to fake up the global temperature data. That's why all but the most gullible adherents have seen they've been had. Yeah, we had all the Arctic weather down here. Coldest winter in 30 years! For all that Arctic air to reach us some other air must have been displaced to fill up the gap left behind. That air was probably warmer and hence there's a bit of a melt this year. So El Nino is weather, but La Nina is climate. That's why you were able to embarrass me with all those full email trails you could show me to prove your case. Oh, wait, you couldn't, because you were making it up. Its all down to the amount of energy the sun kicks out, the sun was really cold last year and we had more ice and we had a cold winter, its cyclic you know, the sun is kicking out more heat but there is a slight lag so expect another coldish winter. Interesting. I presume you have a reference for this, given that solar output can be directly measured? The reason 2013 was being touted as a bad time for arctic ice is because the solar out put should be approach maximum in 2013-2014 and the other biggy, El Nino/ La Nina will also be in a warming stage. All YOU need to know is that the richest people in the WORLD own and have a huge 'vested interest' in seeing their shares (in the fledgling Green and Eco associated companies) grow exponentially in value! It's their next 'hidden' in plain sight way of exploiting the Worlds population whilst they play the countries off against each other and radicalise/mould Green Fascists (unknowingly?) into doing their dirty work through their "wholly owned" media manipulation! We all know things have got to change - but not according to these glo_BA_list fekkers, who seek to exploit us again, after leading the World into this mess to enrich themselves in the first place by stripping the earths resources! So what happened between 1900 and 1945? There was an unusually low number of volcanic eruptions, an ongoing buildup of greenhouse gases and a known increase in solar output. (there are also significant question marks over the records in the 1939-45 region for reasons that you might just be able to work out).